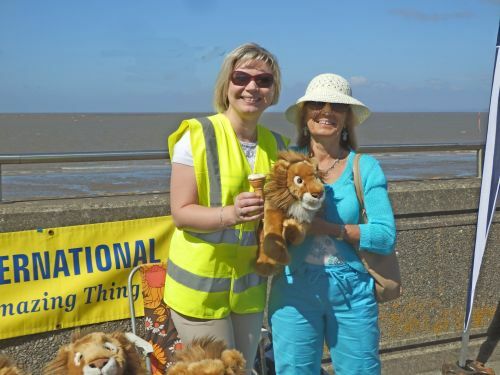 We meet every month at the Fox & Goose Inn to discuss ways of helping in our local Community as well as International humanitarian good causes through Lions International. 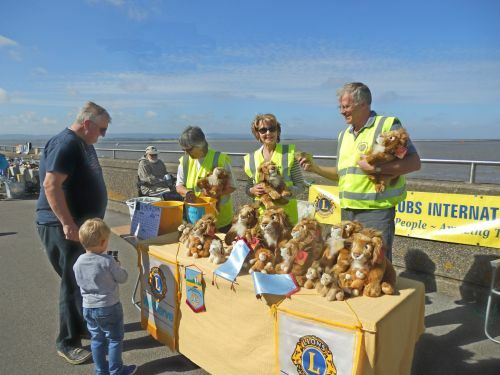 Our Lions Club primarily serves the local communities of Burnham on sea, Berrow, Brean, Highbridge, Brent Knoll and surrounding villages. 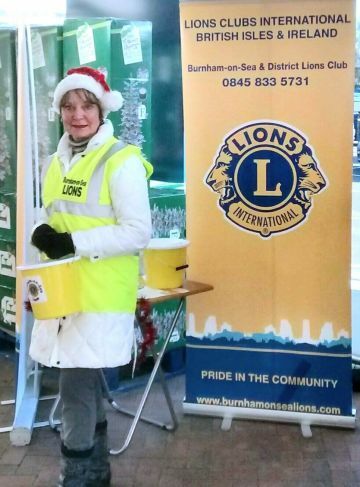 Within these areas, the Lions raise money throughout the year with a wide range of fundraising events. 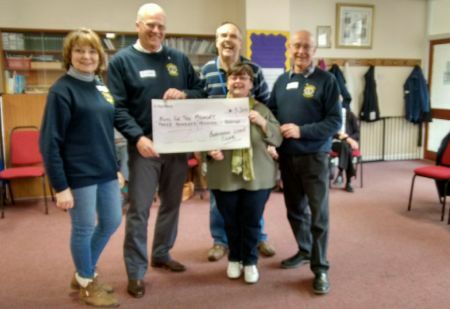 A very brief summary of a visit to the Baptist Hall where I represented the club with Colin and Olive in making a donation to the 'Music for the Memory' group who are one of my charities this year. 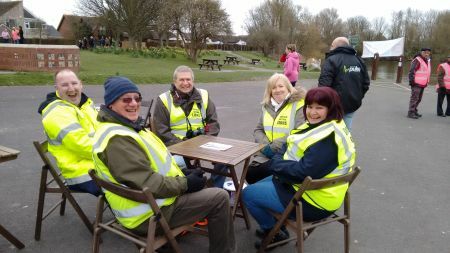 We were welcomed, badged and engaged by members of the committee offered tea, biscuits (but no cider) and invited to join in. After a brief round of introductions using an Irish drum as accompanyment, (today was an Irish themed session) the singing started. Not my forte as Claire will vouch for, but I tried. 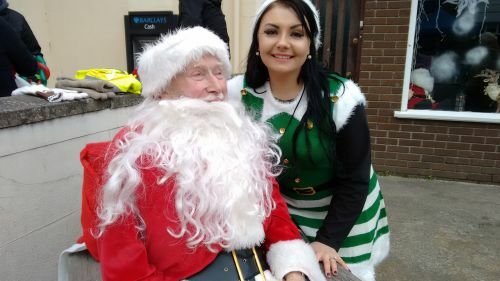 Even though I had no idea of the words or that there were so many verses to certain Irish folk tunes but tap my feet, mouthed lots of Lah-di-dahs and hum along, I did. 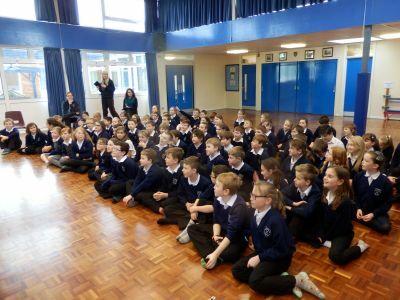 To see the other participants engaging, smiling, clapping, singing with eyes closed and joy on their faces was brilliant. We were even treated to a version of 'Paddy McGinty's ghost' from one lady who had apparently been focussing on the meeting and her rendition for weeks, giving her more than just a focus but a great deal of meaning to her time at home. The ability to remember things is something that I simply take for granted more often than not, but was moved by the difficulties that Alzheimer's disease robs otherwise fit and healthy people of. 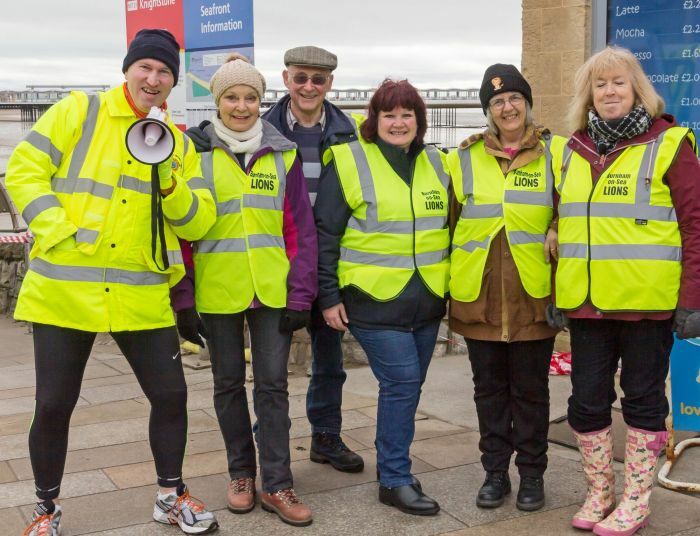 Indeed, a strong committee of organisers, maintain a really valuable self funded community group, friendly, welcoming and doing things for others with the only reward being a sense of goodness. Another uplifting experience I owe to being a member of our Club. On behalf of the recipients of our clubs generosity, and the effort made by all of you at Christmas last year, I can pass on their heartfelt thanks. A genuinely valuable experience, for which I personally thank you all again. 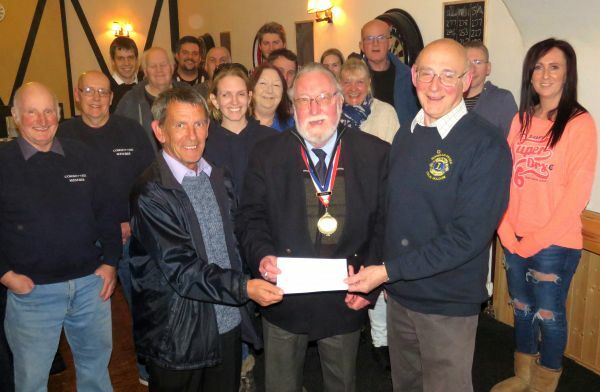 With assistance from other Lions Clubs, Minehead, Weston and Cheltenham, Burnham Lions received a ï¿½1152 cheque from the Highbridge and Burnham Carnival Club. 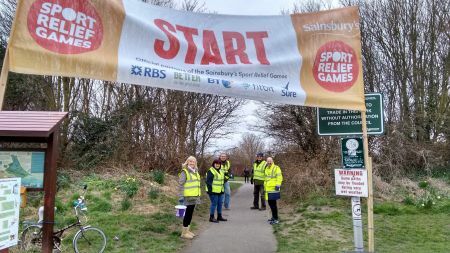 Every penny of this money will be given to well deserving people and charities in the local area. 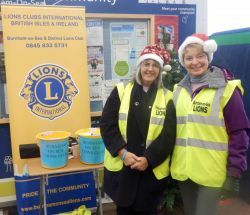 Our Christmas collection at Asda and Lidl raised a considerable amount of money for the Lions to distribute out to several Local Charities. 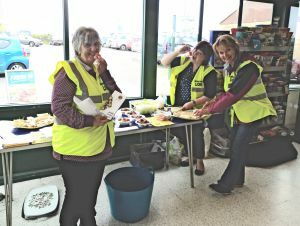 One such was the Highbridge Food Bank. 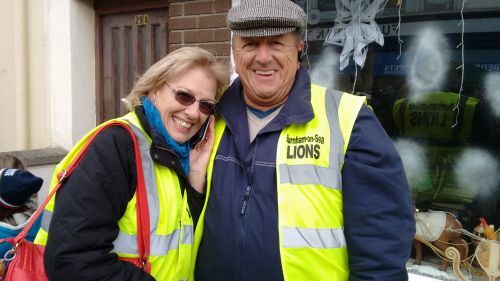 Our President, Lion Roger, and Lion Gwen went on a shopping spree to buy items which were then taken to the Food Bank at the Methodist Church Highbridge. rendition of his shopping experience. 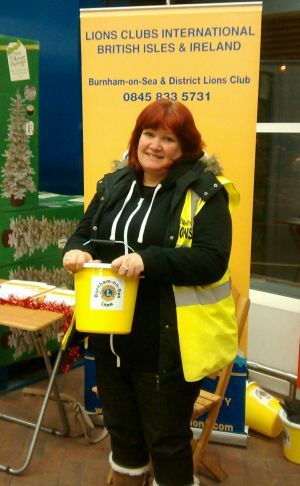 Gwen and Rogerï¿½s Food Bank shopping Expedition - a Mans point of view!!!! Gwen and I spent a pleasant hour or so trundling around Tesco's this morning. All I can say gents, on the spending front, is this.........we let this one get away.
" You'll have to go around again Rog!" Out we trot, fill the boot of my car, load it up and it filled the boot, I promise. Back in we go. This time, I start sweeping stuff off the shelves. I've got the bug. 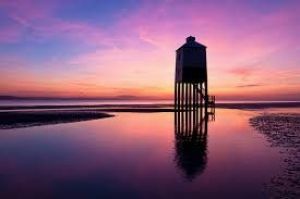 Spend on anything worthwhile, spend on anything on the list, spend on more of the stuff we already bought, spend on anything with a colourful label, spend on anythinig that looks good enough to eat, spend, spend SPEND.................................... Whooaaaooohh! 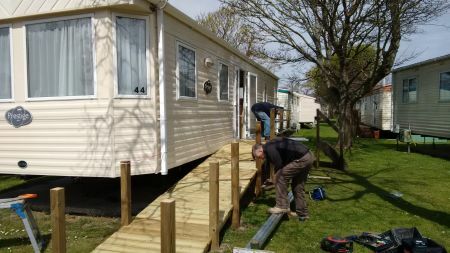 and then shown a stair lift upon which we can put two bags at a time for transporting up the 28 stairs. Yes that's right, twentybloodyeight. If I say the lift was slower than Claire giving the President applause at a Quiz night, then you'll get the drift. Anyway, we shuffled 20+ shopping bags upstairs together with some loose packages to great appreciation again from the helpers there. Very well worthwhile. 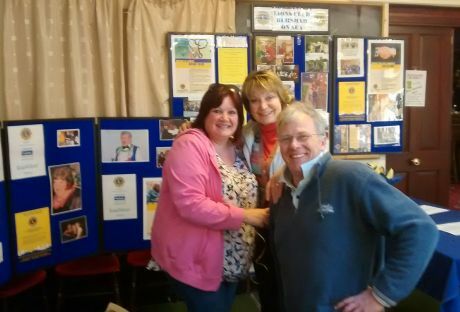 Gwen, I am sure, will give a much more balanced report at the next meeting but thank you all again on behalf of those who will benefit from the public's generosity and the good and kind spirit of the Burnham Lions Club. Thank you Gwen for an enjoyable morning, I appreciate your support most sincerely, and the ribbing you have taken here is only part payment for you know what!!!!!! 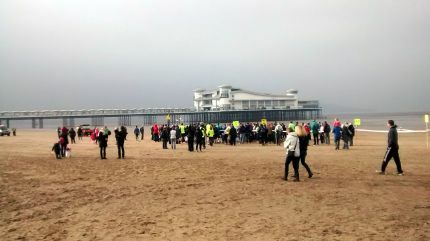 This year Burnham-on-Sea Lions provided the bulk of marshals for the 10 Mile run starting at Weston Grand Pier along the beach, along the promenade, along some of the toll road and through the Weston woods, all the way to Kewstoke and back through the Weston woods and along the promenade down to the beach to the finish line, underneath the Grand Pier. 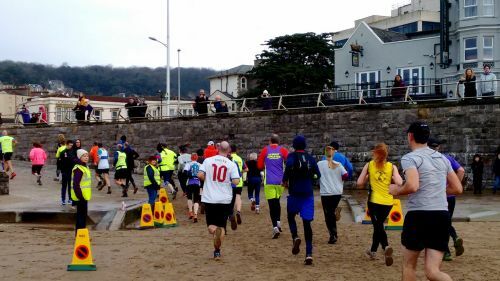 A very rewarding event and an excellent way of raising funds for good causes. 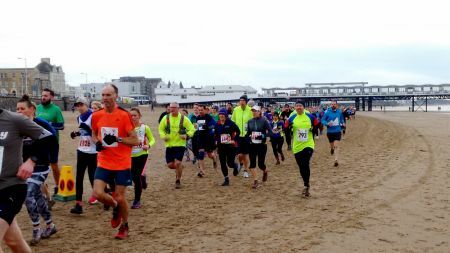 I feel worn out just writing about it, but over 1000 runners took part!! 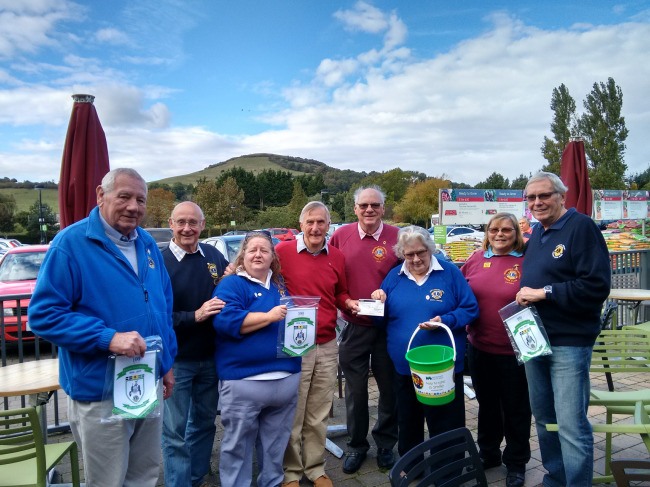 District Governor Lion Fred has completed a 4 day fundraising tractor run around District 105SW during which he visited as many clubs as he could during his travels. 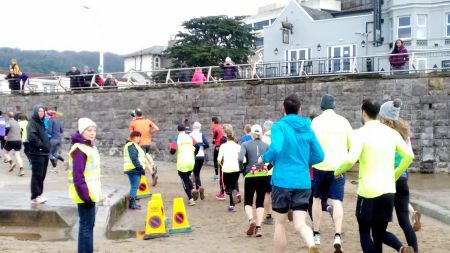 The proceeds are going to Childrens Hospice SW in celebration of the opening of the first hospice 25 years ago this year. Congratulations Fred and the support team for all your efforts. Saunders Garden Centre for the Burnham Lions Presentation, but we gave him the money anyway!! 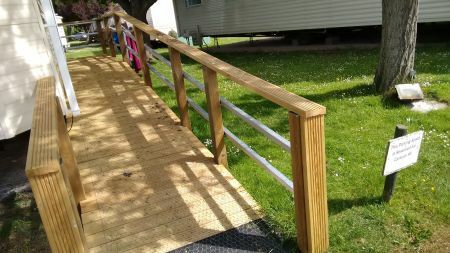 Our illustrious President, Lions Colin Rufus, kindly offered our services to Cheltenham Lions to rebuild a new ramp for their caravan situated at the Lakeside Caravan Park Burnham. 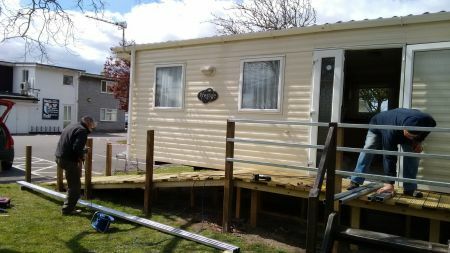 Phil Cooke, Bob Jenner and Colin Holdom, we all assisted Colin Rufus at various stages of the building. As you can see from the photos below, the end result was truly a work of art. 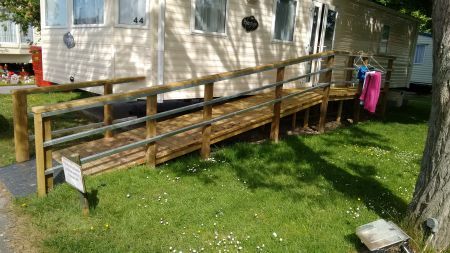 Well done to everyone involved, especially our President Colin Rufus for his overall design and control of his workforce. With his patience and advice, all labour strikes were averted, or was it his provisions of teas several times a day, I'm not sure. 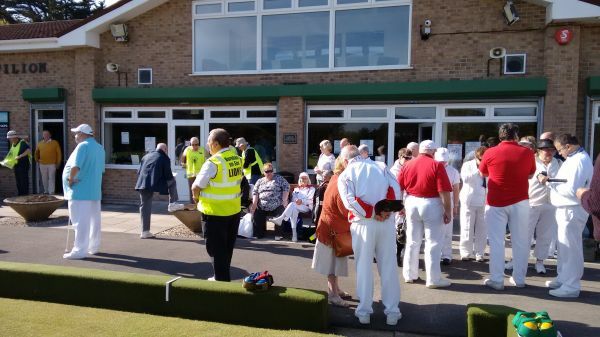 This year Weston Lions organised the Visually Impaired Bowls and once again members of Burnham-on-Sea Lions, and other Lions Club members, offered their assistance by helping as scorers over the 4 day tournaments. 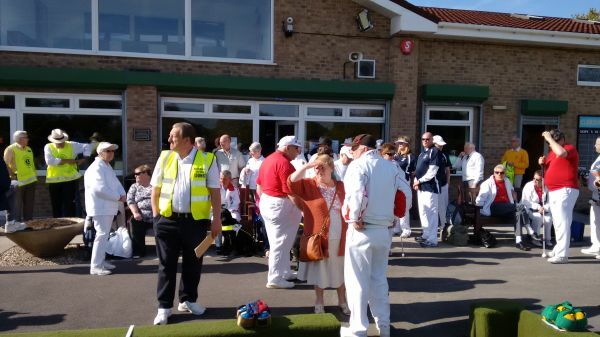 Bowlers from all over the country, including World Champions, each with varying degrees of visual impairment entered the competition, showing us all how talented they were. It was an incredible 4 days and an honour to be able to help - so enjoyable!! 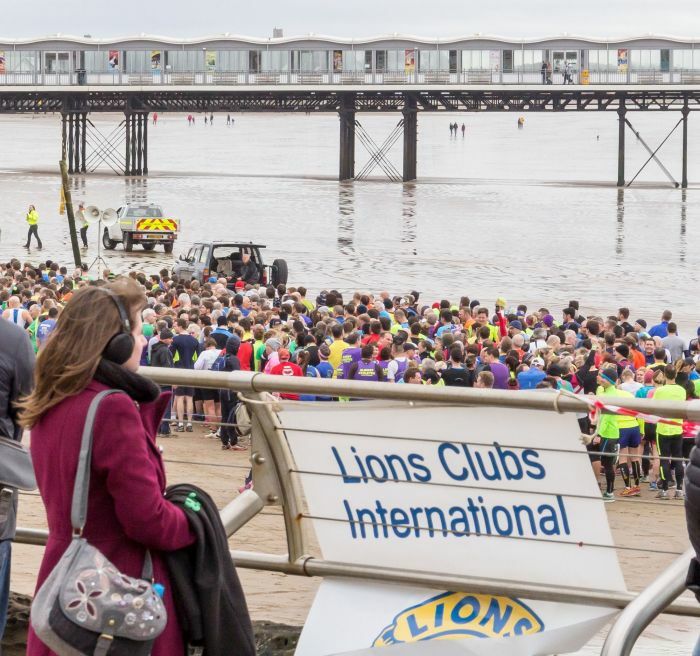 Once again we were asked by Weston Lions to assist them in marshalling the 10 Mile run starting at Weston beach, along the promenade, all the way to Kewstoke and back, through the Weston woods, across to Knightstone island and back to the beach to the finish line. 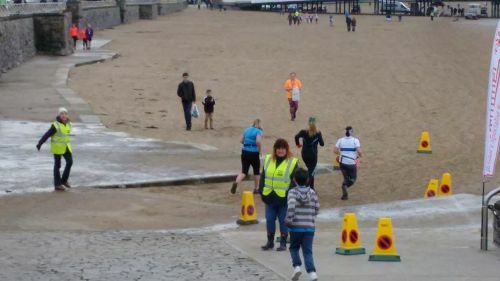 The weather was kind to our 9 marshals for the Sunday morning task. 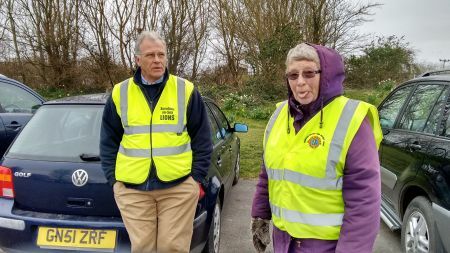 Two of our marshals, Colin Rufus, (our President) and Judie Jones drew the short staws and did a grand job marshalling in the woods by "The Big Tree". 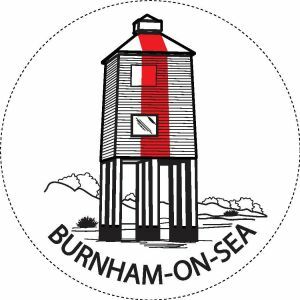 The charity was setup following the tragic death of Burnham teenager Charlie Marks in 2014. 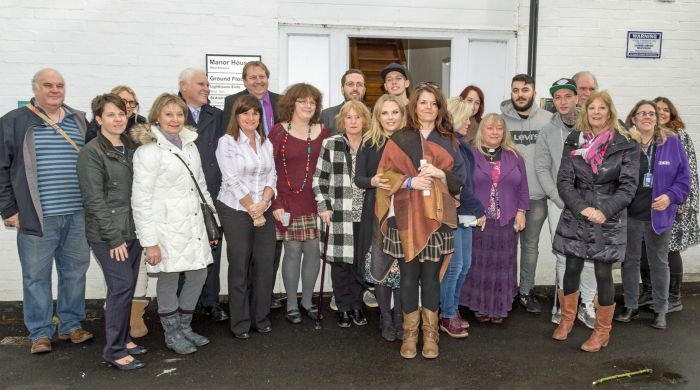 Their aim is to help remove the stigma of mental health and help support young people and their families. 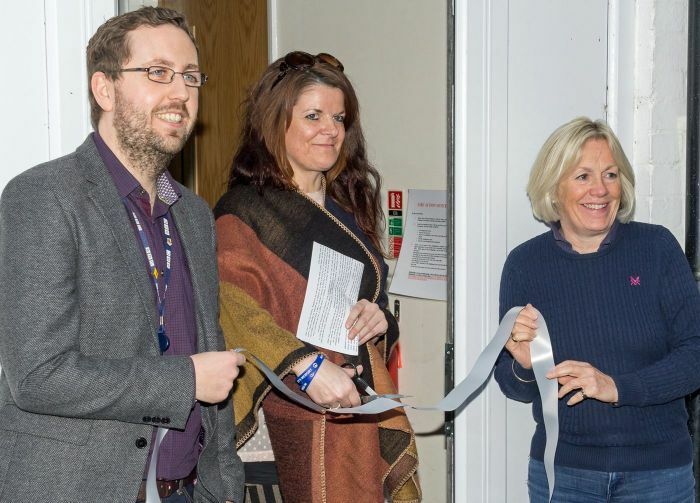 Ben McGrail of BBC Somerset cut the ribbon along with Tessa Munt and Founder of the Charity, Charley's Mum, at the official opening of the offices in Manor House, Manor Gardens. "The most common killer of young men between 18-25 years old is suicide. 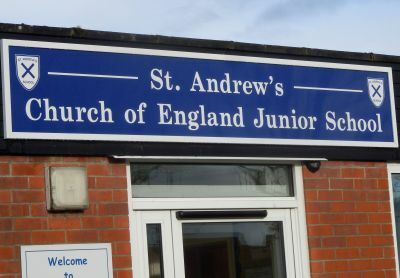 Males are three and a half time more likely to commit suicide compared to females"
Burnham-on-Sea Lions visited St Andrews School to show how important our local community is to us all and give some examples of how the Lions Club have helped people and organisations within the last year. 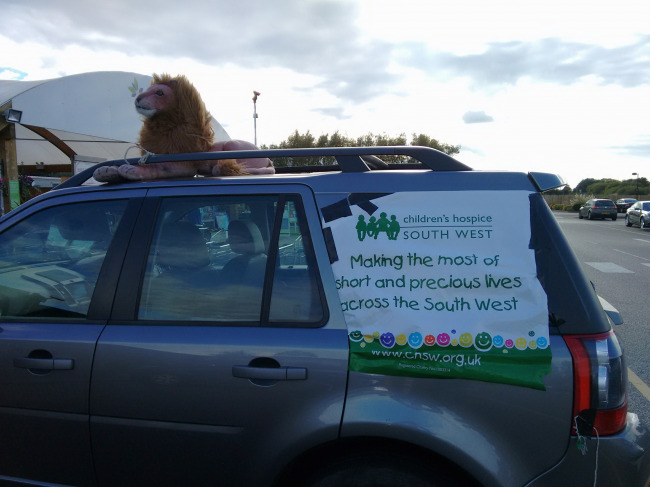 And oh yes, our own Lion Rufus was certainly a great hit as well. Rufus the Lion having fun. I don't think Strictly Come Dancing have anything to worry about. 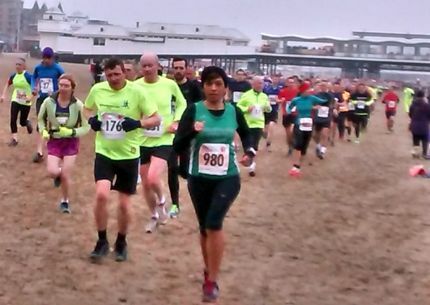 Marshalling once again at the Brent Knoll Run organised by Burnham Harriers. 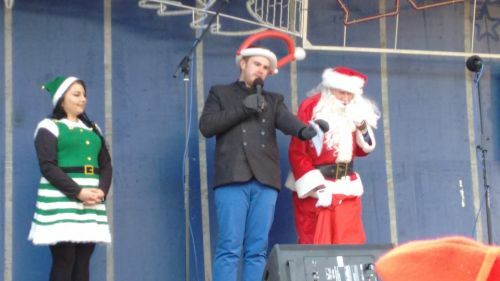 Father Christmas arrives at the Christmas Lights switch on in Burnham. 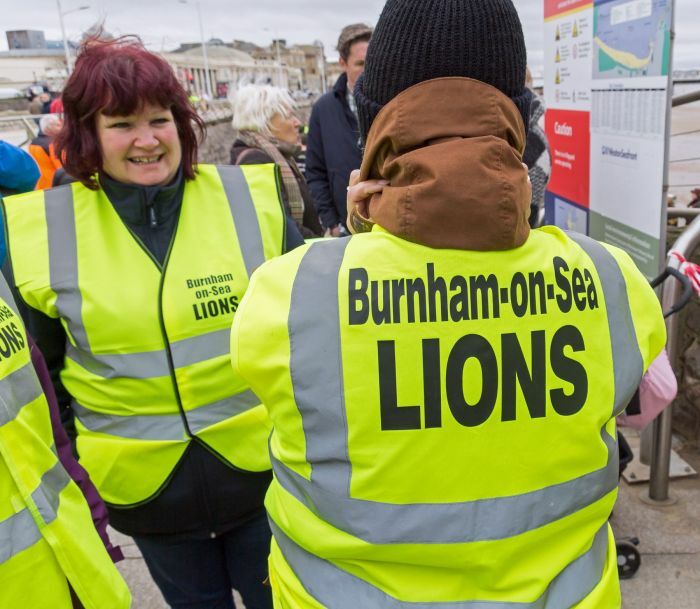 Once again Burnham Lions were out in force helping to control the crowds who came to watch the entertainment prior to the lights switch on. 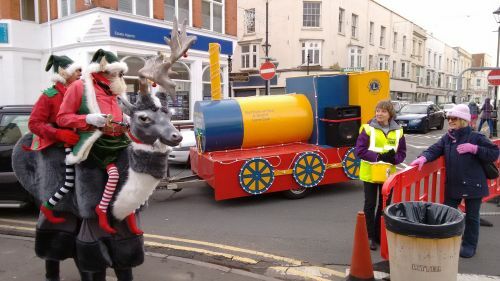 Not only that, we brought Father Christmas on our Christmas train to bring pleasure to the children and hand out bags of sweets. 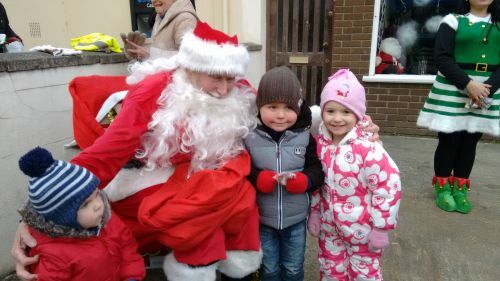 A great time was had by all, especially Father Christmas who loves being with the children. 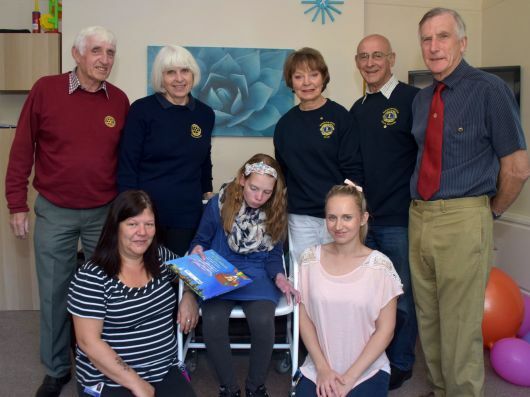 Burnham-on-Sea Lions Club presented a cheque for ï¿½592 to Jenny Allen who is fundraising funds for Cystic Fibrosis Trust. Great Wall of China this month. 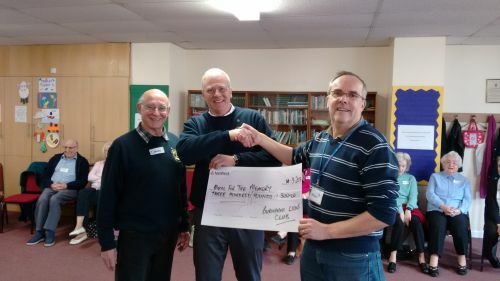 The cheque will help towards Jenny's trip so she can raise a lot more money for Cystic Fibrosis Trust. Here seen outside Material Needs in Burnham is the quilt being presented to the lucky winner who lives in Stoddens Road. 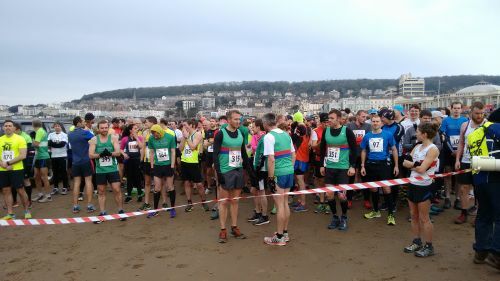 Held at the Beachcomber in Brean, thanks to everyone at the Beachcomber for allowing us to take over the two rooms for an hour to sell our tickets and make the draw - phew absolutely manic, but a tremendous buzz. 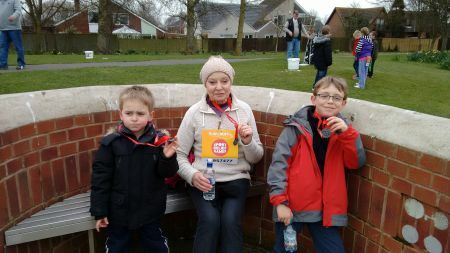 Thanks to the local supermarkets for donating all the Easter eggs - you were great!! 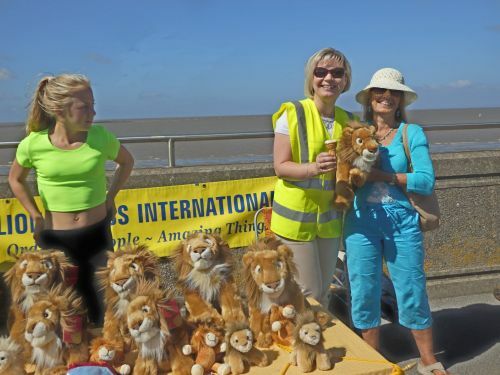 Thanks to all the Lions Members, and two non Lions, who helped organise, sell and run the raffle, and last but certainly not least to the holiday makers at the Beachcomber who gave so generously buying the raffle tickets. 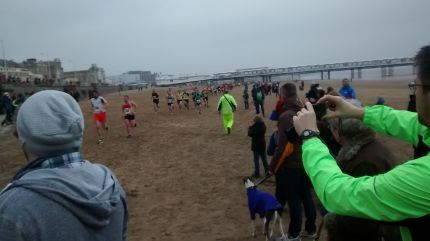 We raised a lot of money for our local good causes in under an hour - brilliant !!! We all enjoyed our evening celebrations at Laburnham House with good food and good company. Three of our willing helpers Claire, Olive and Roger setting up the room for our Charter Night. 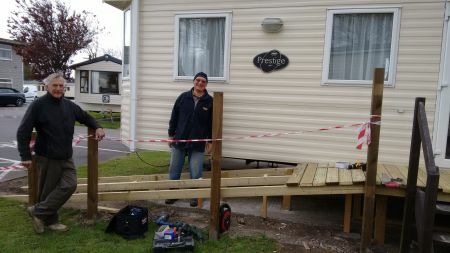 Colin & Eileen Rufus were also helping but were obviously so busy they hadn't time to pose for a photo. Well done everyone, it was a transformation! 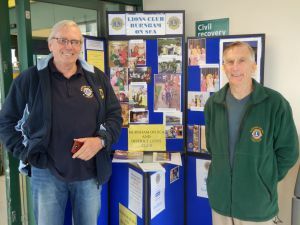 Why not become a friend of the Lions and help us with one or more of our events. 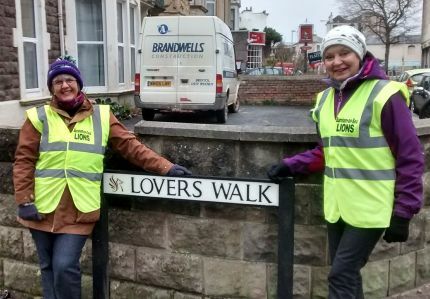 HOW WOULD YOU LIKE TO HELP YOUR LOCAL COMMUNITY WHILST HAVING FUN? 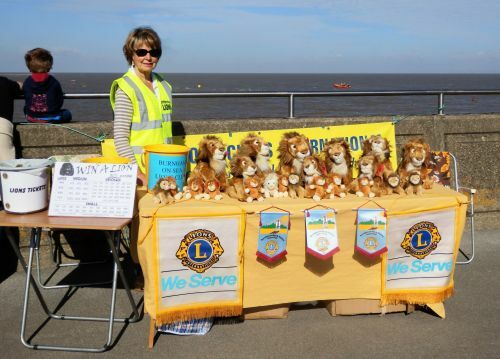 BURNHAM ON SEA LIONS CLUB ARE LOOKING TO EXPAND OUR PRIDE AND WOULD LOVE TO HEAR FROM YOU! 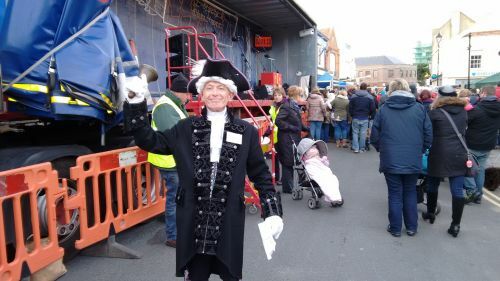 MARSHALLING, COLLECTIONS IN SUPERMARKETS AND CARNIVAL STALLS AT FETES AND EVENTS TO NAME BUT A FEW!!!! 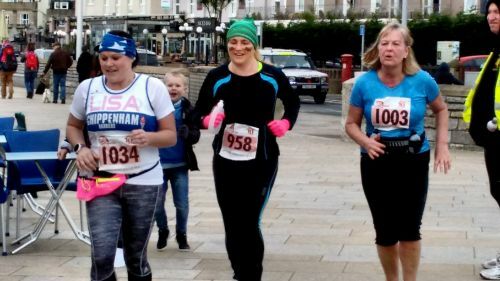 IF YOU WOULD LIKE TO JOIN US WHY NOT CONTACT CLAIRE ON 07882612515 OR EMAIL ON claireandjodie10@aol.com FOR MORE INFORMATION. LOOK FORWARD TO HEARING FROM YOU!!!!! What a brilliant evening we had at our Business Meeting yesterday (4th Feb 2015) at our new venue, The Fox & Goose Inn, on the Bristol Road, Brent Knoll. A big thank you to Gail, the Manager, who offered us the meeting room. Joining us for the evening was the Director General, Alan Good. 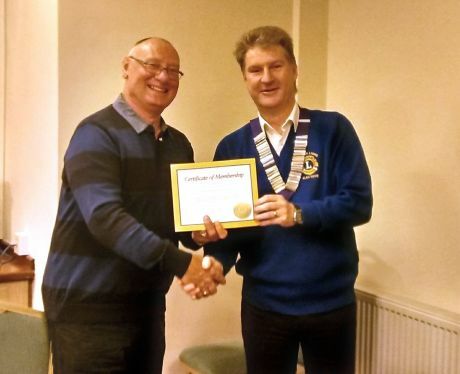 We enjoyed his input to the meeting and I believe he enjoyed the good humour displayed by all the Lions Club Members. 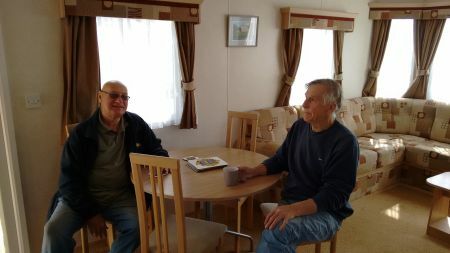 The whole meeting was so much fun for everyone, with so much laughter, but we were still able to get through all the items on the agenda including immediate financial assistance to a young family who only made the request for help 24 hours earlier. How fast can Lions move when necessary!!!! 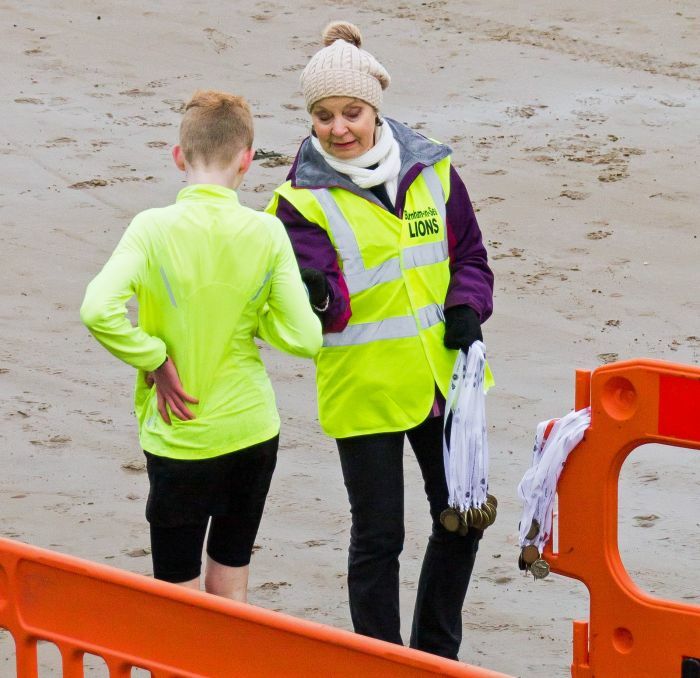 We were asked by Weston Lions to assist them in marshalling the 10 Mile run starting at Weston beach, along the promenade, all the way to Kewstoke and back, through the weston woods, across to Knightstone island and back to the beach to the finish line. 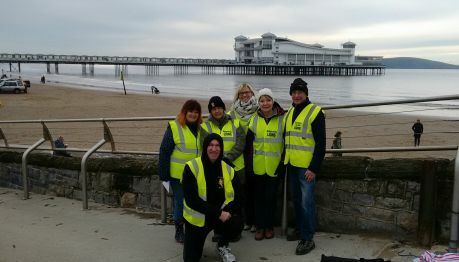 The weather was very kind to our 7 marshals for the Sunday morning task. 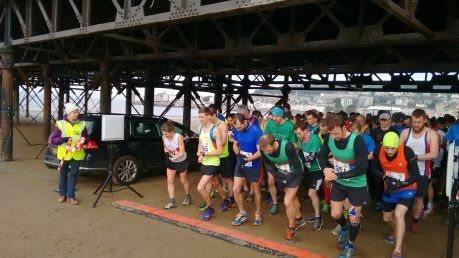 A very rewarding event and an excellent way of raising funds for good causes. 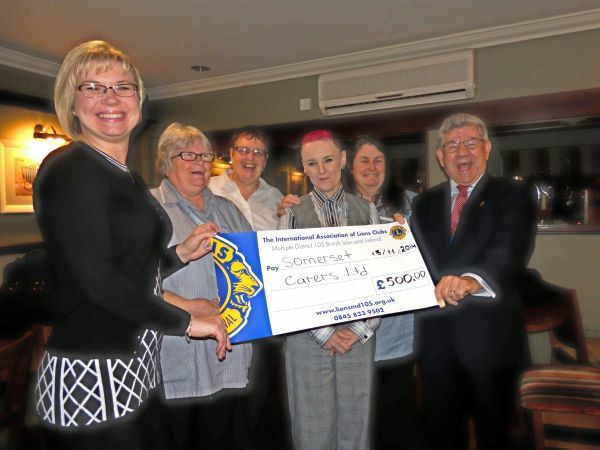 The Lions Club presented a cheque to the Somerset Carers who do a wonderful job looking after elderly people in our local community from the ages of 65 to over 103 years. 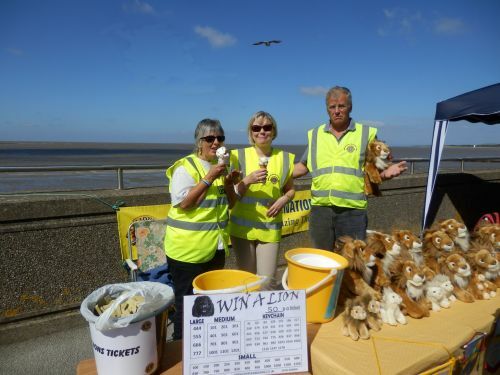 Fundraising with our Lions Tombola on the sea front in Burnham-on-Sea. 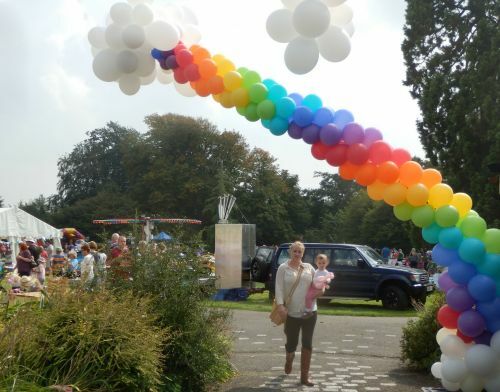 A most enjoyable day was had by all and the weather was very kind to us. 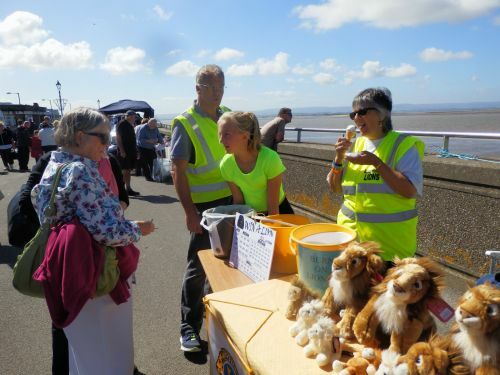 As part of the Lions International World Wide Lunch Relay and a chance to meet the Burnham-on-Sea Lions, the Food Relay was held at Morrisons on June 6th. 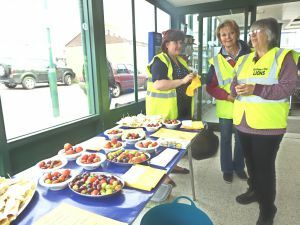 Thanks to Claire who provided all the delicious savoury wraps and bowls of fruit, to Colin Rufus for the Lions displays and to the other helpers on the day. 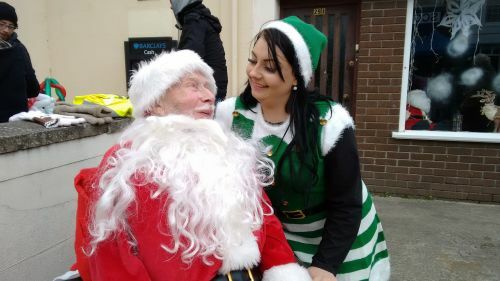 All donations were in aid of the Highbridge Food Bank. 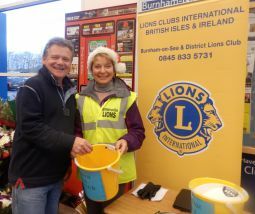 A few days before Christmas saw our Lions Club Members collecting funds for our local charities. We were all braving the wind tunnel conditions in the entrance to the Tesco store. 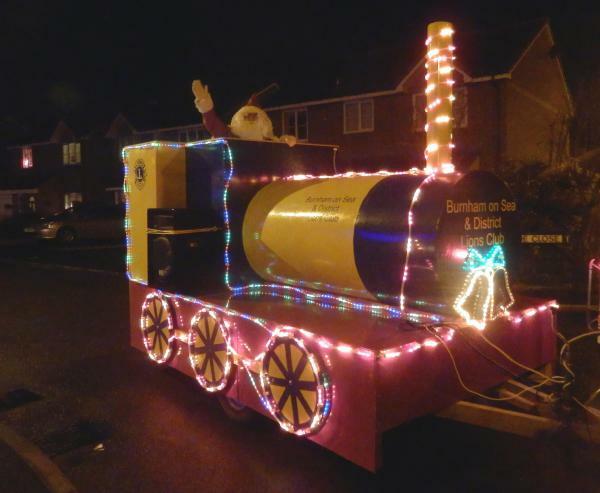 Although it was Friday 13th our Christmas Train took to the streets of Burnham and we all loved it, especially the children who came out of their warm and cosy houses to see it and SANTA. 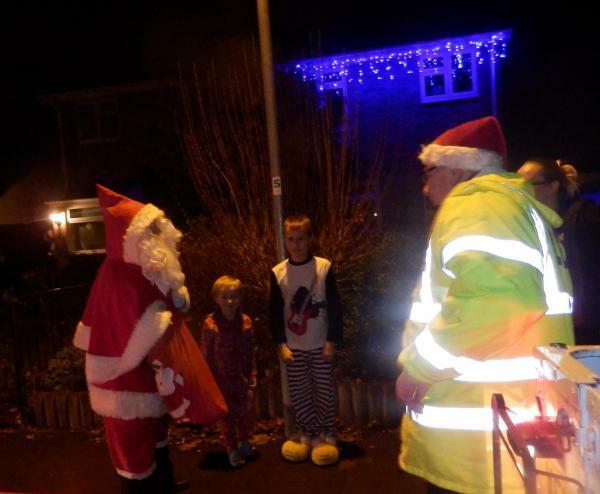 Our thanks go to all those who took part for the evening, especially Mike, (oh I mean Santa), and to Warren Farm who kindly provided us with the Land Rover, as they have done many times before.